By happy coincidence, I was in a Latin Jazz mood when reviewing this CD, brought on by watching the excellent documentary film about The Buena Vista Social Club (Friday evening television), with its lively street scenes of Cuba, biographies of the musicians, and of course the music itself. This CD features the music of Brazil, different country you say, but still with the Latin rhythms and songs of love shot through with images of sea, sand, trees and flowers. 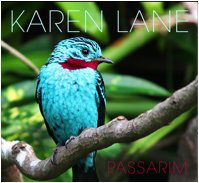 Karen Lane was raised in Perth, Western Australia, and she started off as a soul singer in Sydney in the early 90’s. She eventually settled in the UK, became involved in the jazz scene, and was championed by the chat show host, Michael Parkinson. She has played at venues such as Ronnie Scott’s, Pizza Express, and Cafe De Paris in Monte Carlo. This is her newest album, with a new set of musicians, with some songs in Portuguese and some in English. The musicians are well up to the mark and beyond, the voice is pleasing, with a good range, and the repertoire is of both well-known songs and some less familiar. The language was no barrier to enjoyment. The CD is released this coming Friday, April 27.